I have been involved with Broadway Chorus for almost a year now. I really like the idea behind this chorus, that is to pick popular songs from different shows and tie it together with an original story. So while the audience might know the tunes, the plot itself is a mystery to them. We have a show this week. Check this out!! Somewhere between the land of the "Lost" and "Gilligan's Island" lies the impoverished town of Port Apoti, starting point for the wacky saga that is this year's musical presentation from The Broadway Chorus - Vancouver's most outrageous community chorus! This show has it all: jewel thieves, rampaging pirates, bling-laden gangstas, spurned lovers, a shipwreck, men in trees, men falling out of trees, ridiculous disguises, and of course a happy ending! 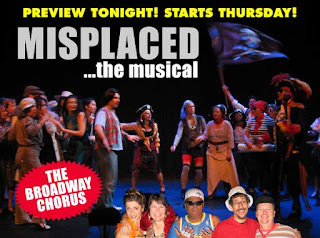 This is the Chorus' most ambitious, hilarious production ever, chock-full of songs - and laughs! The gag-filled story takes us to France, Italy and a mysterious "Survivor"-like island. The tunes include selections from shows old and new, including The Light in the Piazza, Dirty Rotten Scoundrels, Guys and Dolls, The Woman in White, Gypsy, Once On This Island, and more!